This is only the eighth post and already a couple of readers have asked me to explain more about Qigong. My newly renascent writing muse completely balks at the idea of synthesizing pages of internet research on Qigong into interesting Jennifer-speak. It's just too reminiscent of when the candida-brain muse and I stared at 40+ typewritten pages of interview notes and internet research for an entire month in 2008 while trying—and failing—to produce a publishable magazine article about Penang. Besides, this blog is a chronicle of one person's Qigong journey, not a bunch of essays on the practice itself. Last year Sifu H gave me several books on Buddhist-related topics, but none about Qigong. I completely trust his sense of when I'm ready to learn something new and reckon he's got his reasons for not going into it right now. 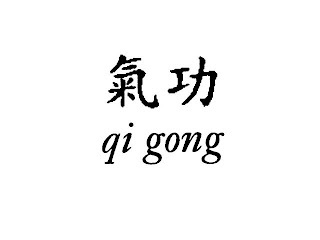 While looking for an image of the two Chinese characters for Qi gong (roughly translated as energy work), I found this overview and history which pretty accurately describe the physical, mental, emotional and spiritual aspects of the practice. Some, but not all, the FAQs are relevant too. All that said, from our first day together in March 2009, Sifu H conveyed tons of useful Qigong tips which I dutifully tried to record. I wanted to capture his every word, but he insisted that until I experienced Qigong in my body, writing words was a waste of time. "The mind is not dependable on," is a typical Sifu statement. And as usual he's right. Paging through my little notebook to pick out salient tips for this post, I'm shocked at how often he repeated the basic tenets and how quickly I completely forgot them. "Forget the words," he'd say when I tried to bring out my digital recorder. "You can't tape record a feeling or how to feel it!" I've got plenty more Sifu-isms for other posts. This sounds deceptively simple but even now I still struggle to understand that Qigong strength comes through letting go, not tensing or forcing. • eyes • neck • shoulders • elbows • coccyx • soles of feet • hips • knees • groin • hands • wrists • fingers. And the most crucial body part of all...... • mind. • Breath can release the mind. • Trust the energy in the dan tian. Let it guide the body. • Energy moves body, not vice versa!